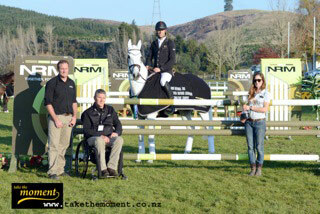 Fog, earthquakes, sun and above all, some world-class displays of eventing riding, eventing horses, and cross country courses; that was the weekend at the NRM National Three Day Eventing Championships in Taupo. Clarke Johnstone and Balmoral Sensation continued their sensational new partnership with a win in the NRM CCI***, leading from start to finish. The combination jumped faultlessly in both cross country and show jumping, with just a few cross country time faults to add to their dressage score. Johnstone also admitted to probably being a bit too tired to celebrate much until later in the week. “Having five horses at a three day is not easy.” Johnstone publicly thanked his groom Lydia Beale when accepting the trophy, saying that his event consisted of either riding horses or walking courses. His next event will be at the Melbourne 3 Day Event, but as a coach of the New Zealand Young Rider team rather than a rider. Cambridge’s Kelsey Rothery and The Felon moved into third place after the show jumping phase, ending a consistent season for this pair. Rothery also picked up the prize for the best dressed rider in the CCI*** section. Angela Lloyd and Song had three rails down in the show jumping to drop to fourth place and Fraser King on Nadal KSNZ was fifth. In the Bates CCI**, Diane Gilder was the winner on her lovely gelding Your Attorney, a great present on her 28th birthday. Amanda Pottinger made her grandmother, Tiny White, the Patron of Equestrian Sports NZ, very proud when she topped off a great weekend with a second placing on Achilles II in this prestigious class to go with her win in the CCI*. Helen Bruce and Toblerone NZPH were third, and it was great to see Dannie Lodder on Moochi complete a clear show jumping round after a crashing fall yesterday in the cross country off one of her other horses. Five combinations jumped clean showjumping rounds, and only two finished on their dressage score. Diane Gilder was one and the other one was Kate Fleming with Mendelsshon who looked very accomplished on the cross country and showjumping. Of the 31 starters, 14 did not complete. Bundy Philpott, who had a bad fall in the NRM CCI*** resulting in a broken pelvis and a stay in Waikato Hospital, accounted for three of these withdrawals. The Fiber Fresh CCI* Championship competition was a pressure test and Amanda Pottinger emerged the winner on Just Kidding after Tayla Mason and Royalty dropped a rail in the showjumping. James Jackson came up to third place after a clear showjumping round, getting ahead of Cherie Jaques, Davina Waddy and Aleisha Collett who all had faults in the last phase. Overall the standard of competition was very good in the Fiber Fresh CCI* Championship, with 20 clear jumping rounds in the cross country within the time, and 12 clear rounds in the show jumping. Sixteen out of the 46 starters did not finish the competition. Madison Crowe capped off her recent selection in the New Zealand Young Riders team by winning the AMS Saddlery CCI* Open class on Brogan. Fifth after the dressage, Crowe finished on her dressage score of 51.3. She was closely followed by her Young Rider team mate, Sarah Young on Regal Romar on 52.2. Abby Lawrence on NRM Ru Star dropped a rail and incurred time faults in the show jumping to finish third. The other Young Rider team member riding at the event, Jessica Woods on Defies Logic, also put in a great performance to finish in fourth place. The Young Rider team elected to start their horses in the lower graded course as preparation for their 2* level course at the Melbourne 3 Day Event in early June. There were only three horses finishing on their dressage score. As well as Crowe and Young, Tessa Jacks with Cracker Jack Candy also jumped cleanly the whole weekend. Only five horses did not complete the event out of the 20 starters. The Thoroughbreds in Equestrian Sports competition run over the CCI1* divisions, was won by Amanda Pottinger on Just Kidding. Abby Lawrence and NRM Ru Star were second, with Rowan Dixon on Major Vibes third, Claudia Wilson fourth Citadelle, and Courtney Davis fifth on By Hoki. Otorohanga’s Cherie Jaques on Black Gem triumphed in the Bombers Bits / Prestige Floats CCN105 Championship when she finished on her dressage score of 34. Also finishing on her dressage score to take second place was Samantha Felton on Ricker Ridge Rui. Elise Edwards took one rail to relinquish her lead after cross country, and finished in third place. Black Gem, the winning horse, is a five-year-old thoroughbred by Brilliance and is owned by Jacques. Seven combinations finished on their dressage score, and 17 horses did not complete the competition out of the 48 starters. Whangarei’s Emma Broughton-Watt on Lochinvar was the winner with one of a number of double clear rounds in the Wade Equine Coaches CCN105 Open Class. Third after the dressage, she kept her composure and her lead over Zoe Ander and Waitangi Slingshot and Kari Wratten-Lowe on Nip and Tuck. Nine combinations finished on their dressage score. The dressage leader, Tania Baker and Guilt Trip, incurred a number of faults on the cross country and withdrew from proceedings on the third day. Some 14 other combinations did not complete the three day event. The Silver Spurs trophy was won by the North Island, narrowly from the South Island. Jessica Woods on her four-year-old Elf was the winner of the Young Event Horse National Championship. The top five scorers in Friday morning’s competition came back into the main arena to be judged again, on a clean slate. Woods was the top scorer and also performed well again to take out the title. Ocean McKinnon was second and her horse, Graffiti MH, also won the best mare prize. Clarke Johnstone on In Disguise was third, with Samantha Felton and Ricker Ridge Rui fourth. Donna Smith on Piper was fifth and also won the NZ Thoroughbred Racing prize for best thoroughbred.